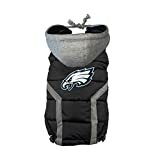 A high quality NFL dog puffer vest. Water repellent quilted shell with soft fleece interior. The fleece zipper hood is removable. Excellent fit with velcro closure and toggle adjustments. Reflective safety stripe. Embroidered team logo.